It’s a little late in the night, I know. I’m here sipping on the last of my fizzy violet cocktail. Not so fizzy anymore. We hosted my family yesterday for my mom’s birthday, with a good deal of violets and some foraged field garlic. Dinner consisted of roast lamb stuffed with Swiss chard and Merguez sausage, smashed potatoes with field garlic and maple glazed carrots. And that cake with violet jam? Delicious! Don’t worry, photos and recipes coming soon. We’re not very good at stocking a bar. Sure, we have plenty of booze, but not too good with the mixers part. Instead we often have a signature cocktail, if you will, ready for guests to start the evening along with plenty of local wine and beer. I made fizzy violet cocktails by the pitcher, and always forgetting how large the pitcher really is (it looks average size but fits about 1.5 liters), had to manage with some leftover cocktails tonight. A bit flat by now, but still quite tasty. But that’s neither here or there. You’re here to figure out what else you can do with those beautiful violets you spent all weekend foraging for. You did really forage, didn’t you…? I’ve saved the best for last. Yes, another recipe that takes a bit of time, but waiting time really. The process itself is pretty simple. Leda Meredith’s original recipe suggests 10 minutes of actual work, but it seems I work more on the slower side. I would say half an hour is a generous and more accurate estimation. So what are we doing tonight with our purple little gems? Candying them! As a child I used to dip rinsed violets in sugar or honey and eat them fresh. I never thought much about keeping them for the long run, just gobbled them up as they grew. 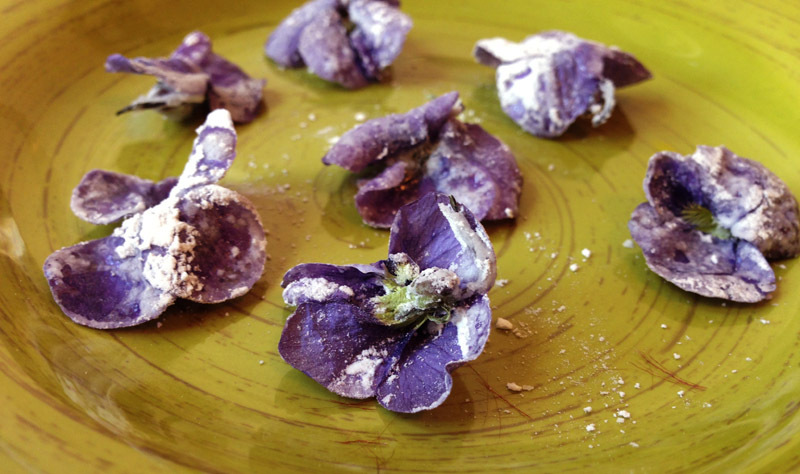 Preserving the violets gives you a crunchy little snack, if you really want to eat the solo, or beautiful petals to scatter on desserts or in salads, long after they’re available in the fields. And when candied, you still enjoy the most of the violet flavors. You’re consuming the while bud (with a bit of sugar) rather than an infused product of them. Sweet, floral and green is really the only way I know how to describe them. 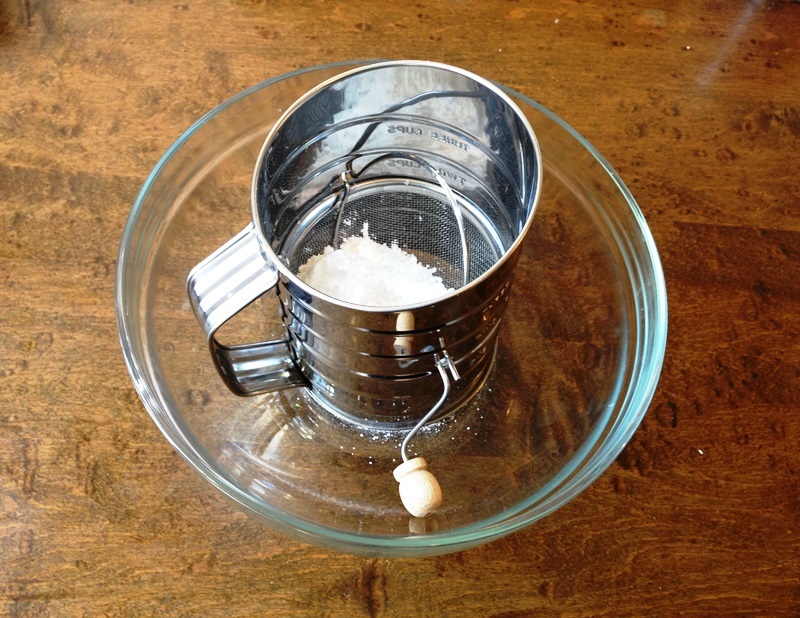 In a small bowl, whisk egg what until completely frothy but not stiff. In a separate, larger bowl, set sifter filled with powdered sugar. Line baking sheet with parchment paper. Sifting over a bowl prevents “candied” counter-tops! 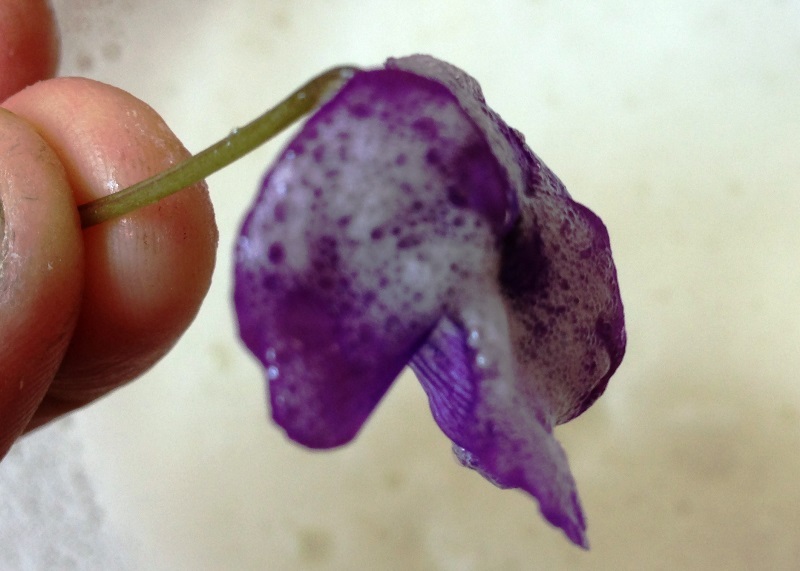 Holding a violet by its stem, dip in egg white, twirling a bit to coat entire flower. Shake off excess egg white and reopen petals if necessary (sometimes they stick together). Dipping the violets in egg white. Hold flower over larger bowl and gently sift sugar over flower to fully cover (I find twirling the stem as you sift works well to cover flower). No need to worry about candying the stem, as you’ll discard this eventually. Place flower on parchment paper. 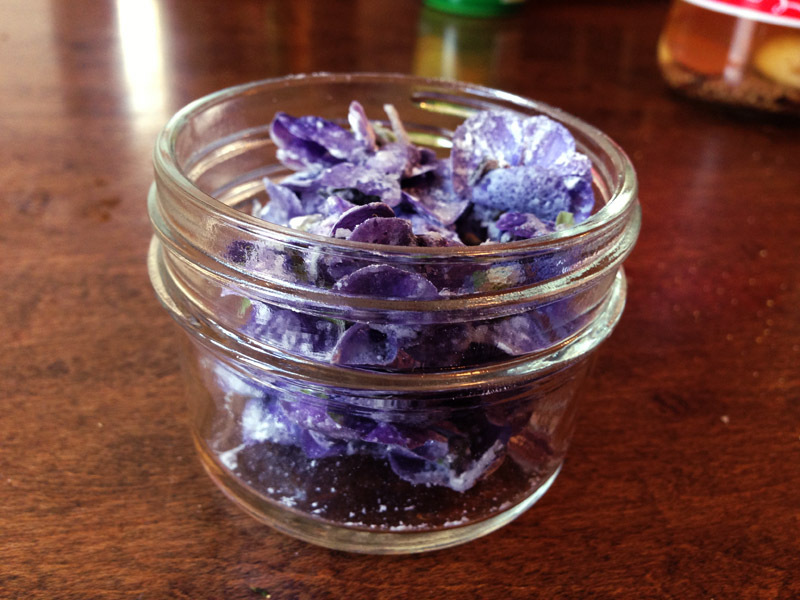 Repeat egg and sugar steps with the rest of your violets. Make sure the violets are separated enough so none of the flowers touch. As your sifter runs out of powdered sugar, simply scoop up the excess from the large bowl to refill. 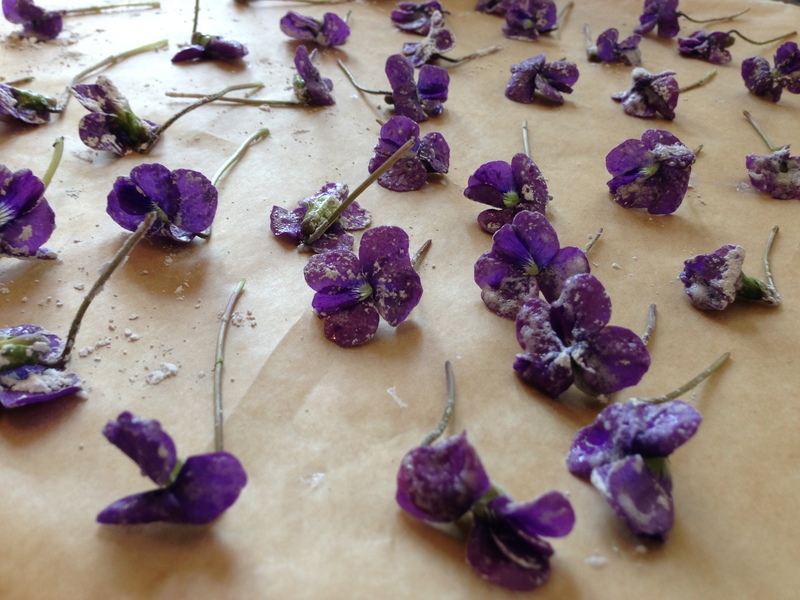 Dry violets on parchment lined baking sheet. Transfer parchment lined cookie sheet filled with flowers to the top shelf of your refrigerator. Refrigerate, uncovered for 24 hours. As the flowers dry most of the sugar will be absorbed by the egg white, creating a glaze on the petals. The next day, take the sheet of violets out of the refrigerator and let sit out at room temperature (in a place that gets sun is best) for another 24 hours. Once candying process is complete, snip off stems and discard. Transfer violets to an airtight container and store at room temperature. Candied violets will keep for a couple of months. Make sure not to overfill your container–you don’t want to damage the delicate petals!